Viber, the leading messaging app, celebrates a chatting experience makeover offering its 1 billion registered users the power to exchange messages at twice the speed. Ensuring a remarkable and efficient chatting experience, messages are sent and deliveredat twice the speed with delivery status updates. Additionally, Viber is rolling out its new and improved design for a faster chat flow and a chat platform that is easy and attractive. Users no longer have to wonder if friends they have been chatting to have opened their messages and what is taking them so long to respond? Instead, Viber is now taking instant messaging to an ‘ultra’ real-time level by making it easier than before to keep tabs on all of one’s friends and all chats with its enhanced chat screen facelift. As a part of Viber’s makeover, users have the benefit of receiving faster messages than ever before. Messages are now delivered twice as fast as before so that chats flow more naturally and move along more quickly, eliminating the panic of an unanswered text. With Viber’s quicker message status icons, the new icons formessage delivery statuses reflect the platform’s faster sending time. Now users can see more quickly whether the recipient has read the message. ‘✓’ means the has been message sent, while ‘✓✓’ means the message has been delivered to the recipient’s phone and ‘✓✓’ also means the recipient has seen the message. The platform’s bigger and brighter chat bubbles provides users more focus and attention on the chat content. 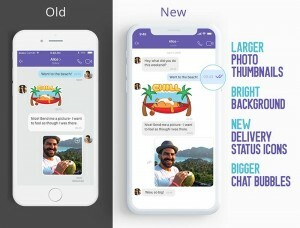 The Viber facelift also presents a brighter chat color scheme and bigger chat bubbles, to show more content in the screen making it easy for users to see more at one glance. Viber also now offers a sharper GIF, photo and video experience. For many users a picture’s worth a thousand words. Now when Viber users receive photos or videos, they will see them in bigger, higher quality thumbnails in their chat screen and enjoy sharing these photos with friends and family via chats. Additionally, Viber boasts end-to-end encryption, making it the safest messenger platform available. Users know that by using Viber their data and content isn’t shared with third parties, with even Viber unable to access it – guaranteeing100% privacy. The new faster chat screen experience is globally available for all iPhone users and will be rolled out to Android users soon.